Our IT experts will work with you to design and build a secure, scalable and cost-effective colocation package that will power your business. Phoenix Internet is one of the most respected data centers for business in Arizona and Phoenix colocation service providers. Businesses depend on our reliable Phoenix colocation spaces to save time and money by using a shared data colocation server. We provide colocation web services in Arizona to help companies recover sensitive data quickly in case of a system crash. Internet colocation is fast and dependable. 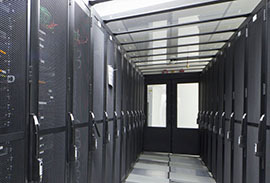 Phoenix Internet offers a secure, scalable, cost-effective colocation package that powers your business. Contact us today to get a reasonable colocation quote for your business. Phoenix Internet also offers high-speed wireless Internet service in areas nobody else can with 99.990% guaranteed uptime. Our dedicated customer service team can help keep your business connected with customers by colocating everything or setting up temporary servers on an as-needed basis. You will not find higher quality colocation in Phoenix, AZ.